What is the National Gathering on Christian Initiation™? The National Gathering on Christian Initiation™ is an annual two-day conference for parish Christian initiation ministers and diocesan catechetical, liturgical, and evangelization leaders. 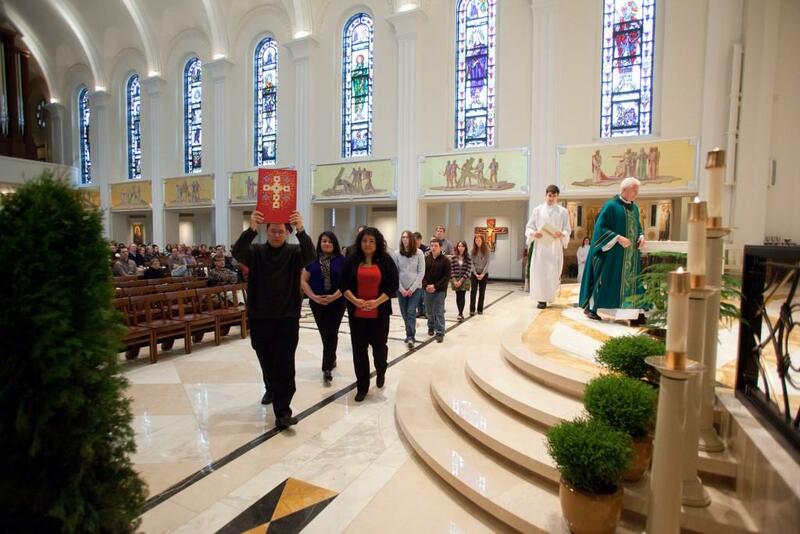 Steeped in the vision of the Rite of Christian Initiation of Adults, the National Gathering on Christian Initiation™ seeks to promote the vision of the Church as constantly evangelizing, catechizing, and initiating disciples. See About NGCI for more information. Who is hosting the National Gathering on Christian Initiation™? 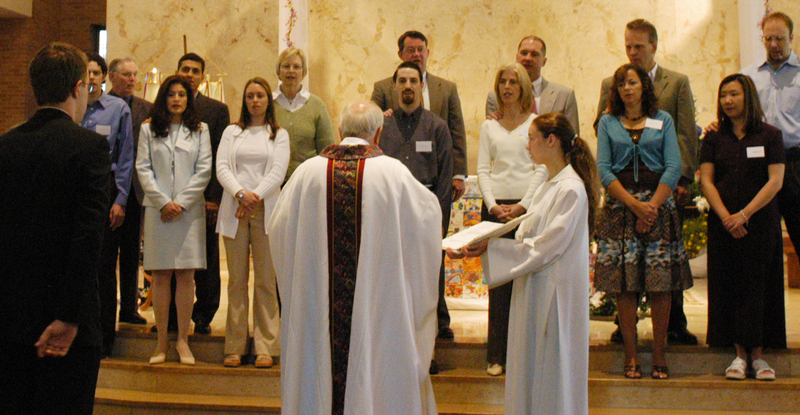 Liturgy Training Publications, an agency of the Archdiocese of Chicago, is hosting the National Gathering on Christian Initiation™ to promote the full implementation of the Rite of Christian Initiation of Adults. LTP has long been a leader in promoting the baptismal catechumenate. Click here to learn more about LTP. When is the 2019 National Gathering on Christian Initiation™? The 2019 National Gathering on Christian Initiation™ will take place on July 2–3, 2019, with an opening reception on the evening of July 1, 2019. What is the theme for the 2019 National Gathering on Christian Initiation™? The 2019 theme for the National Gathering on Christian Initiation™ is The Year-Round Catechumenate. To learn more about our theme for the 2019 gathering, please visit https://www.ngci.org/2019. Why should I attend the National Gathering on Christian Initiation™? The National Gathering on Christian Initiation™ will gather parish leaders, initiation ministers, and regional or diocesan trainers from around the country to explore the theoretical and practical aspects of initiation ministry. This event is designed to help participants come to a deeper understanding of the Rite of Christian Initiation of Adults, challenging all to reflect on ways their community might more fully implement the vision of the RCIA as expressed in this document. 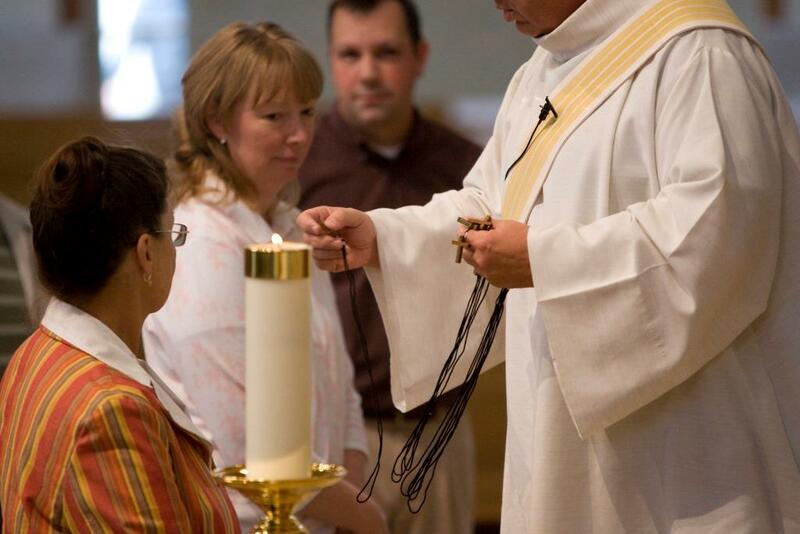 In community with initiation ministers from around the country, participants will experience expert training, engage in discussion, learn from interactive multimedia presentations, and prayerfully reflect on the liturgies of the RCIA. I am interested in the 2019 National Gathering on Christian Initiation™ and would like to share some information with my pastor/parish leaders/RCIA team. Do you have any materials available to share? In addition to this website, we have several resources available for you! We have a short promotional video available here, which you are welcome to share via e-mail or social media. Will there be a 2020 National Gathering on Christian Initiation™? Yes! The 2020 National Gathering on Christian Initiation™ is currently in development. More information will be available in the summer of 2019. Stay tuned! Individual registration is $200 for those who register by March 6, 2019. Registration will increase to $250 for those who register between March 7, 2019 and May 11, 2019. Registration includes lunch on July 2nd and July 3rd. There is also an optional opening reception, which is available for purchase at $30. The opening reception will take place on July 1st from 7:00pm to 9:00pm and will include an open bar. The deadline for registration is May 11, 2019. Registration includes lunch on July 2nd and 3rd, complementary resources from LTP, expert training from leaders in Christian initiation, and fellowship with initiation ministers from around the country. I would like to pay by check. Who should I make the check payable to? I would like to register but I am not yet sure whether I will be available for the evening reception. Can I register for the reception separately? Yes. Please call us at 800-933-1800 if you would like to add the opening reception to your registration. You will also have the option to purchase a ticket to the opening reception at the event. Letters postmarked more than thirty (30) calendar days prior to arrival will receive a 100% refund. Letters postmarked more than fifteen (15) but less than thirty (30) calendar days prior to arrival will receive a 75% refund. Letters postmarked less than fifteen (15) calendar days prior to arrival will not receive a refund. I registered, but I can no longer attend the event. Can my colleague come in my place? Attendee changes or substitutions may be made to any attendee registration until the first date of the event for a $5.00 administrative service charge. Substitutions or changes done on site after the event has commenced will be subject to a $10.00 administrative service charge. However, once you have received your badge on site, it cannot be changed, substituted, or reissued to a different person. Do you offer any discounted registration rates or scholarship options? LTP has already supplemented the price of the conference in order to make it more affordable for individual participants. Unfortunately, we cannot offer any additional discounts or scholarship options. If you would like to participate but find that cost is an obstacle, we encourage you to reach out to your diocesan office to find out what sorts of local scholarship options may be available. No. Registration must be completed by the deadline. Who is invited to the National Gathering on Christian Initiation™? The National Gathering on Christian Initiation™ is designed for parish Christian initiation ministers and diocesan catechetical, liturgical, and evangelization leaders. The gathering will be organized in two tracks. Parish leaders and initiation ministers will deepen and enrich their work as they gain practical skills, discuss common challenges, and share best practices. Regional or diocesan trainers will explore and discuss practical strategies for implementing effective training and formation in their local communities. I see that registration is available in two tracks. How do I determine which track to register under? The tracks are primarily organized based on the level at which you participate in Christian initiation in your diocese. If you are involved at the parish level, either as a leader or as an initiation minister, you would register for the Parish Leader and Initiation Minister track. If your work in initiation ministry is more focused on the diocesan level, training parish leaders and organizing initiation ministry across a large region containing multiple communities, then you would register for the Regional or Diocesan Trainers track. If you have any further questions about which track might best suit your level of experience, we suggest contacting us at ngci@ltp.org and explaining your question or concern. We would be more than happy to help. I am new to Christian initiation ministry. Can I still participate in the National Gathering on Christian Initiation™? Of course! We would love for new initiation ministers to attend the National Gathering. We will be offering pre-conference distance learning sessions for new initiation ministers and all those involved in exploring the basics of the Rite of Christian Initiation of Adults. If you do not already own a copy of the Rite of Christian Initiation of Adults, we do recommend that you purchase one and become familiar with the text prior to the conference. As always, please contact us at ngci@ltp.org with any questions or concerns. Will the National Gathering on Christian Initiation™ be offered in Spanish? The 2019 NGCI will be presented in English. Supplementary materials will be offered in Spanish. My organization is interested in getting involved in the 2019 National Gathering on Christian Initiation™. Are there any exhibitor or sponsorship opportunities available? Yes! We would love to partner with other organizations that are interested in promoting the full vision of the baptismal catechumenate as outlined in the Rite of Christian Initiation of Adults. Please contact us at ngci@ltp.org and let us know what you are thinking. We would be more than happy to start the conversation. We have tried to anticipate as many of your questions as possible, but if you do not find the answer to your question on this website, we suggest you contact us by e-mail at ngci@ltp.org or by phone at 773-579-4900, extension 3554. Will you be recording the sessions? We will not be recording the sessions for public use. We will, however, be filming over the course of the conference for promotional and educational purposes. By attending the Event you acknowledge and agree to grant National Gathering on Christian Initiation™ the right at the Event to record, film, photograph, or capture your likeness in any media now available or hereafter developed and to distribute, broadcast, use, or otherwise globally to disseminate, in perpetuity, such media without any further approval from you or any payment to you. This grant to National Gathering on Christian Initiation™ includes, but is not limited to, the right to edit such media, the right to use the media alone or together with other information, and the right to allow others to use or disseminate the media.